Possessive pronouns indicate who possesses (owns) something. The older second person singular thy, [ðai] in Southern Scots, or thee, [ði] in Northern and [diː] in Insular Scots, stil survives to some extent. 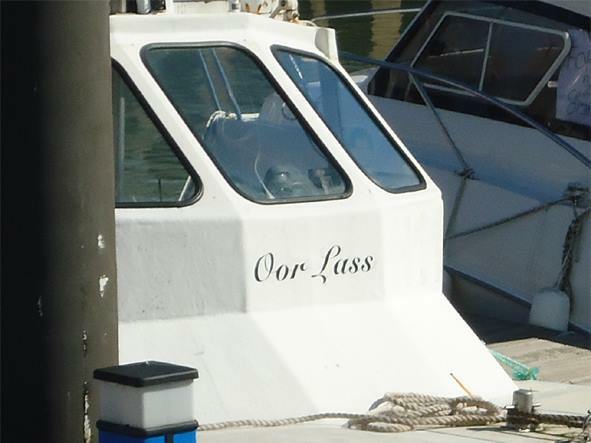 The from thine only survives in Insular Scots as 'dine(s)s'. Where thy/thee and thine(s) are used as the familiar form by parents speaking to children, elders to youngsters, or between friends or equals and your(s) used formally when speaking to a superior or when a youngster addresses an elder. His may be contracted 's in unemphatic positions. Jeams sang for's daily breid. James sang for his daily bread. He'll no tak ane o's dugs. He'll not take one of his dogs. He left wi's ain coat. He left with his own coat. The older form thy (second person singular) survived in most dialects until the mid-nineteenth century and still exists to some extent in Southern, North Northern ('thee') and Insular ('dee') varieties. Although the following qualitative nouns are singular the possessive pronoun referring to them is used in the plural. 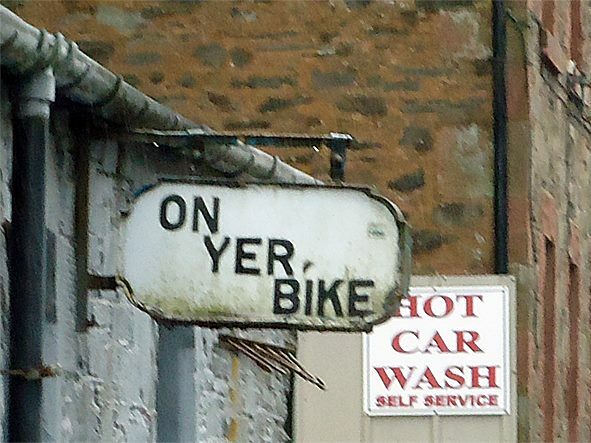 Awbody haes thair ain draff-poke tae cairy. Everyone has his own draff-sack (i.e. fault) to carry. Somebody's left thair fitmerks ahint thaim. Someone has left his footprints behind him. It's no aft onybody finds thair wey here. It is seldom that anyone finds his way here. Ilk ane's tae dae thair bit for the kirk fête. Everyone has to do his bit for the church fête. Note the following usage of possessive pronouns. Come awa tae yer tea. A haena gotten ma denner yet. He's awa hame til his supper. He has gone home for supper. The older form thine survives only in Insular varieties as 'dine(s)', where thy 'dy' and thine(s) are used as the familiar form by parents speaking to children, elders to youngsters, or between friends or equals, and your(s) is used formally when speaking to a superior or when a younger person addresses an elder. That is my old tower. That that old cow shed is mine. It's no good at all. Are ye siccar that's yours? Are you sure that is yours? Yerhoose is fawin doun but thairs isna. Your house is falling down but theirs isn't. Thair schame for tae mak siller's mair better nor his. Their plan to make money is better than his. Lippen til her; she kens wir thochties anent it. Trust her; she knows our ideas about it.